Google has done it again! They have released yet another product in their quest to takeover the world, or at least Apple. What is it now? Google Keep. While it is tough to argue with the following and the large number of features of evernote, google keep is definitely a product to keep your eyes on. Every day we all see, hear or think of things we need to remember. Usually we grab a pad of sticky-notes, scribble a reminder and put it on the desk, the fridge or the relevant page of a magazine. Unfortunately, if you’re like me you probably often discover that the desk, fridge or magazine wasn’t such a clever place to leave the note after all…it’s rarely where you need it when you need it. Pro tip: for adding thoughts quickly without unlocking your device there’s a lock screen widget (on devices running Android 4.2+). 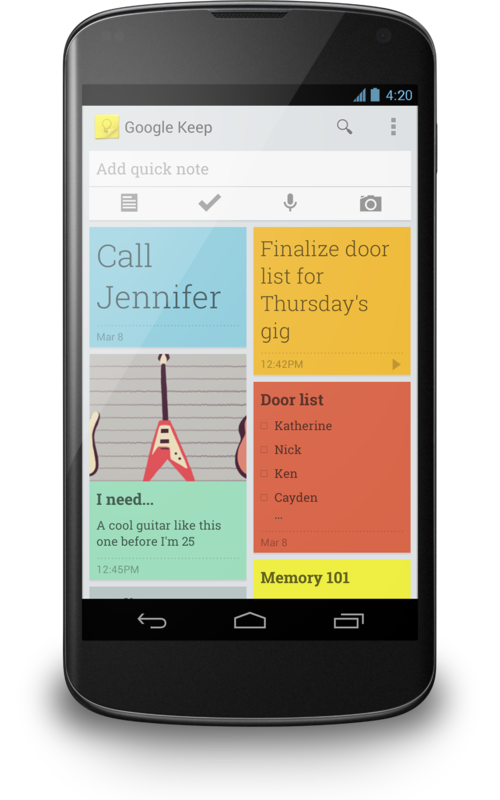 Google Keep is available on Google Play for devices running Android 4.0, Ice Cream Sandwich and above. You can access, edit and create new notes on the web at http://drive.google.com/keep and in the coming weeks you’ll be able to do the same directly from Google Drive.